Elephant Island - Living closely brings strains, the "upstairs people" have little space when the weather confines us to our bags. Southern Sky - Sea grows silent, a thin film of ice is forming, the sea is starting to freeze around us speed reduced to 5kts, pack appearing. Elephant Island - Mild, overcast, very close packed ice in the bay. From all parts of our low roof dangle a collection of blubbery garments, hung to dry. Ernest Shackleton - North to avoid and skirt the pack, heading south again, 3pm line of pack sighted, about 70 miles from Elephant Island, our boat cannot enter even moderate ice. 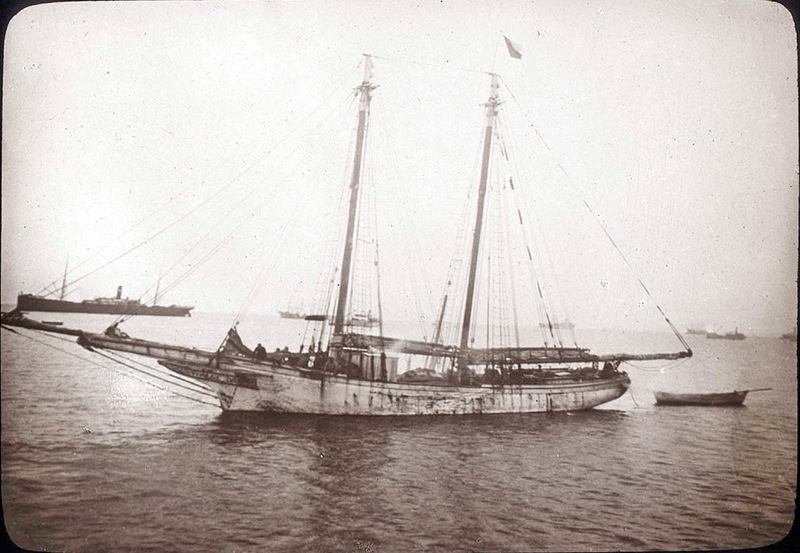 Ernest Shackleton - Tried once again to move south, heavy pack. It was hard to admit failure, but coal is low, will proceed to the Falklands for a better vessel. 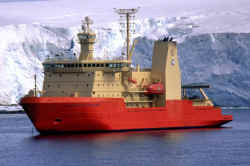 Ernest Shackleton - Arrive in Falklands, there is no suitable ship in the islands, none from England until October. Contacting governments in South America. Elephant Island - One hot meal a day due to lack of fuel. Faces, hands black with soot, blubber and grime, food comes with condiments of feathers and hair. Elephant Island - 163 penguins and a seal caught in a few days! Some had undigested 2nd hand fish bonuses. 6 weeks since Shackleton left, Wild keeps us optimistic. 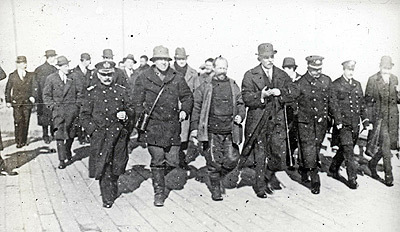 Ernest Shackleton - Uruguayan government have offered a trawler generously equipped with coal, provisions, clothing etc. We await her arrival in Port Stanley. 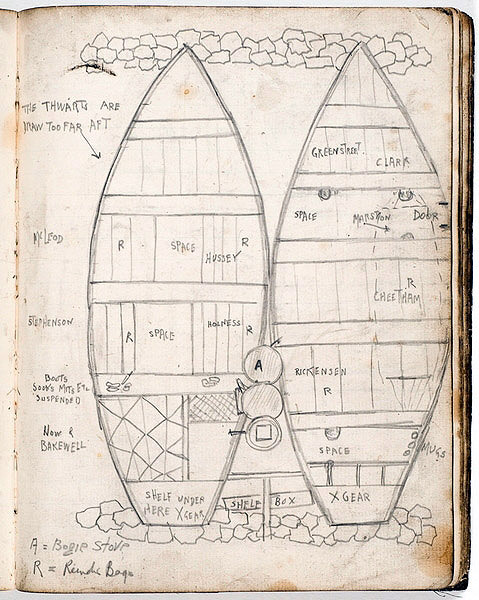 Elephant Island - We speculate much about Shackleton, assume tried to reach us with an iron whaler turned back by ice, so seeks a suitable but rarer wooden ship. Ernest Shackleton - Trawler "Instituto de Pesca No. 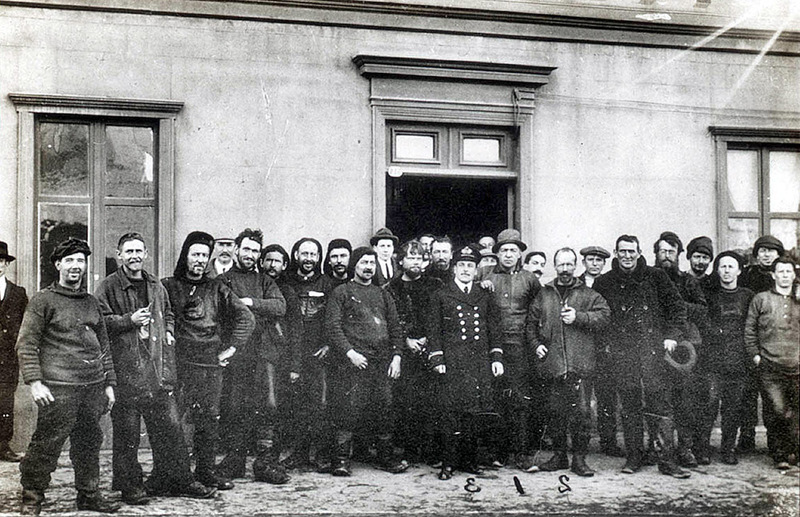 1" arrived today from Uruguay, we left at once for Elephant Island, bad weather but making good progress at 6knts. Elephant Island - No work to be done outside, an hour's exercise each day is all we need to do, wet and blizzard keep us in our bags for 2-3 days at times. Ernest Shackleton - Sighted peaks of Elephant Island at dawn, our ancient enemy the pack lay in wait, within 20 miles the trawler was stopped by an impenetrable barrier of ice. Ernest Shackleton - Tried to push through ice but no progress, danger to propeller, just 3 days coal so turned back. Fog hid the lower slopes, no visual contact. Elephant Island - Mild and calm weather gets us all out for some exercise, escaping the ubiquitous sooty and oily blubber film of the hut interior. Elephant Island - Drs. McIlroy & Macklin amputate Blackborow's frostbitten left toes, Hurley stokes the stove with penguin skins, all else but Wild out. Elephant Island - Back to our cosy bags after 3hrs sheltering in a cave, patient sleeps off the anaesthetic, sing-song in the evening, Hussey on his banjo. Elephant Island - Preparing for midwinter tomorrow, giddy at the thoughts of a change to our diet of meat, meat and more meat, at least we don't starve. Ernest Shackleton - Trawler engine in bad shape, can't wait for repair offered by Uruguayan government Leaving Falklands for Tierra del Fuego to seek another ship. 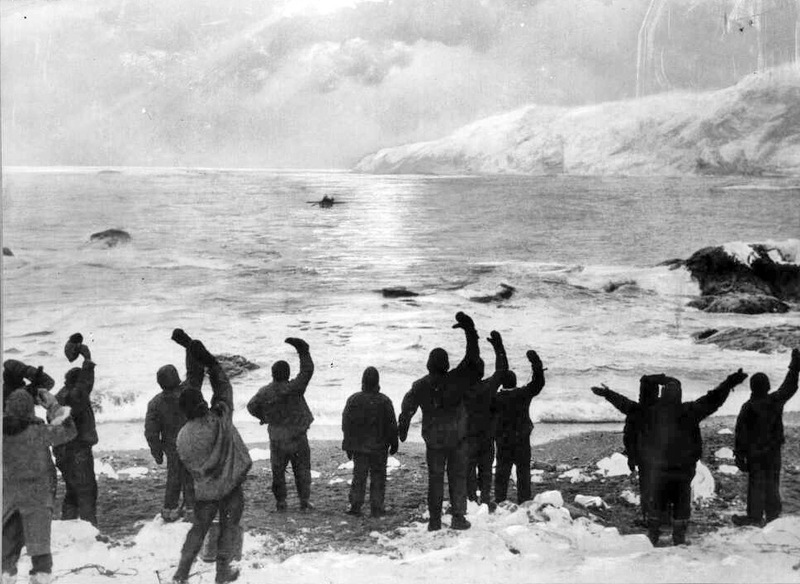 Elephant Island - Breakfasted like Antarctic Kings, thick hoosh of Bovril sledging rations and hot drink made from Trumilk powder, peace and goodwill prevails. Elephant Island - Lunch - 12 mouldy nut food bars, 20 biscuits and 4 sledging rations boiled together, there is nothing so delicious! Dense fog, no pack ice. Elephant Island - Dinner another triumph, followed by toasts and a concert. Orde-Lees "...and so ended one of the happiest days of my life". Elephant Island - South west blizzard means we are in our bags talking between chattering teeth and thinking of the next meal. 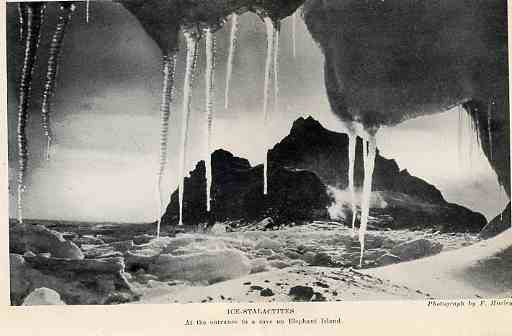 Elephant Island - Sometimes wonder if Shackleton made it at all, perhaps he has to wait for the Aurora, in which case we cannot expect rescue before late July. Elephant Island - New menu reflects lack of options, tobacco low, substitutes tried - penguin feathers, rope, dried meat, grass. Elephant Island - The most wonderful sunrise after a blizzard, clouds and our glacier lit up crimson then gold, inky night chased away to pale blue. Ernest Shackleton - British Association of Magellanes in Punta Arenas raised £1500 in 3 days, 40 yr. old wooden schooner "Emma" was prepared and equipped. Ernest Shackleton - Chilean gov. 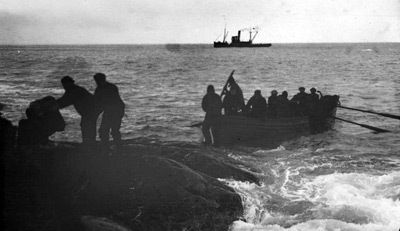 lent us the steamer "Yelcho" to tow us, once more we set for the South to rescue our 22 on Elephant Is. Elephant Island - Orde-Lees: if warmth continues may have to take off jersey.. seldom off since 27/10/15 when the ship was crushed, never seen the skin of my body since then. Ernest Shackleton - Bad weather meant yesterday spent at anchor, cannot delay so started again this morning, with the crack of a gun, the tow rope broke. Ernest Shackleton - Increasing gale, lumpy sea, tow rope parted at 12 and again at 1. By 3 Yelcho bilges full of water, coal low, Shackleton let them return to harbour. 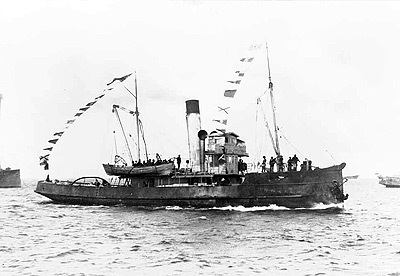 Ernest Shackleton - Continuous bad weather for last 3 days, "Emma" now alone and sailing south again to attempt rescue, grave fears about the 22 men on Elephant Island. Elephant Island - Huge chunk of our glacier fell thunderously raising a 40ft wave straight at our hut, brash ice in the bay damped the wave and saved us. Elephant Island - Blackborrow's feet not healing well, Hudson very ill, they stay in the hut, heated discussions on relative merits of crumpets or muffins. 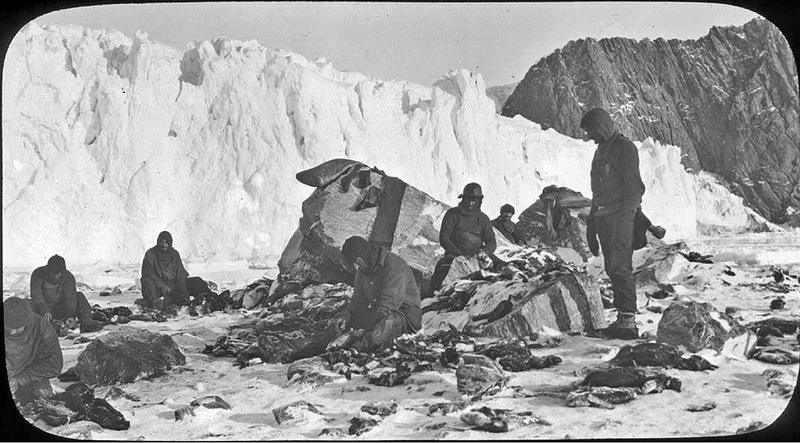 Elephant Island - Balmy weather, some of us shake / beat sleeping bags outside, falling hairs and rubbish are collected and smoked for stray tobacco particles. 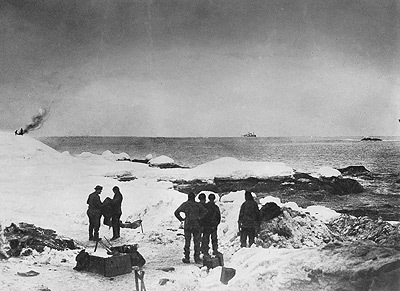 Ernest Shackleton - 100 miles from Elephant Island at dawn met ice, bobstay broke, engine water inlet ice-choked, ice too heavy to push through, left pack and stood to the east. Ernest Shackleton - Hove to overnight, the engine has broken down, we now have sail only. Ice is moving north, made some progress, 108 miles from Elephant Island at noon. Ernest Shackleton - Ropes are thick as an arm with frozen spray, cold and violent tossing of the storm taking its toll on the crew, ice still blocks the way. Elephant Island - Wild calculates Aurora could be with us on Aug 25 if that is what we are waiting for, thoughts turn to summer escape if no ship turns up. Ernest Shackleton - The persistent south winds are dead ahead, we go south at every chance but always a line of ice blocks the way, we may have to turn back. Ernest Shackleton - cannot reach Elephant Island under these conditions, have turned north to clear the Emma of heavy ice masses, it is difficult to turn back a 3rd time. Elephant Island - celebrated a good catch of penguins with a tot of methylated spirits at lunch, even the most rabid teetotallers have taken to it. Elephant Island - Today is 2 yrs since the Endurance left London and 12 months since she was first severely nipped by the ice, still we face uncertainty. Ernest Shackleton - A tempestuous passage, still some days from Port Stanley. I don't believe the ice remains fast to Elephant Island during the winter, just loose pack. Ernest Shackleton - Back in the Falklands after a hard and difficult passage, the worse for having failed to reach our men, Discovery due to arrive mid September. 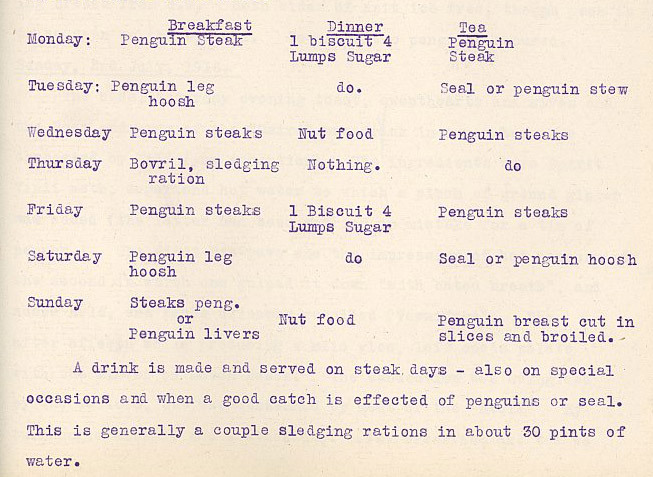 Elephant Island - Food other than wild-caught is very low now, 700 biscuits in reserve, Clarke has taken over as cook, a splendid seaweed hoosh for supper. Ernest Shackleton - In Stanley one can walk 1.5 miles from the slaughter house to the graveyard, or walk the same in reverse, I cannot wait 6 or 7 weeks here. 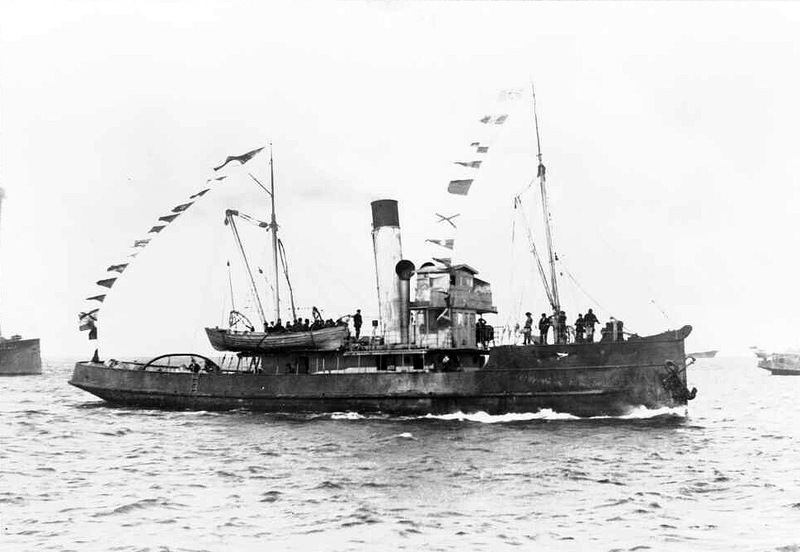 Ernest Shackleton - Chilean government have agreed to send the tug "Yelcho" to take us and the "Emma" across to Punta Arenas, they have been constantly helpful. Elephant Island - Drank the last of our meths, the last of the milk powder went long ago, on the brighter side we can sometimes get limpets to add to our diet. Ernest Shackleton - Have arrived at Punta Arenas, crossing in a north west gale and narrowly escaping disaster, there is still no suitable ship to tackle the ice. Elephant Island - Gathering limpets from rock pools in balmy temps is occupying our days but is leading to cliques forming and uneven food distribution. Ernest Shackleton - Discovery will arrive Sept 20th under Admiralty command, to effect my own rescue have again begged Chilean government to let me have the Yelcho. 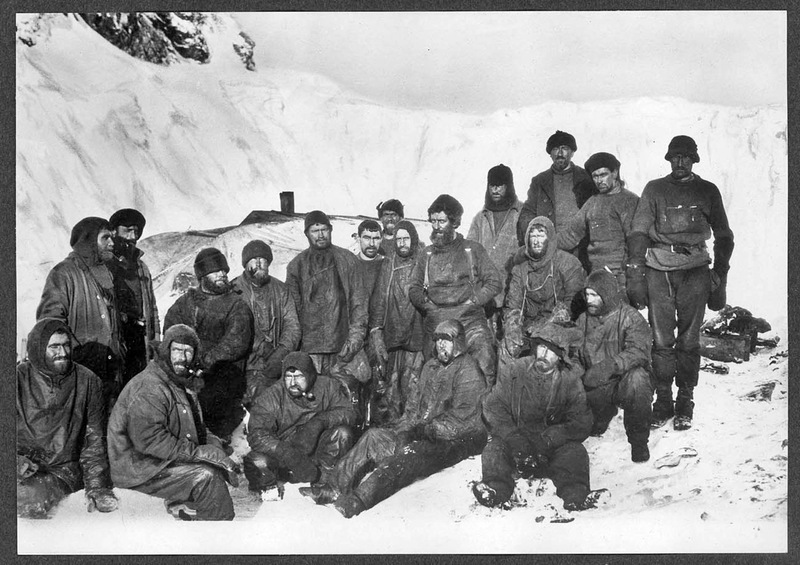 Elephant Island - Non-return of Shackleton openly discussed by all, wood, nails etc. carefully being saved in preparation for a spring boat journey to Deception Island. Elephant Island - Winter has returned, heavy snowfall, deep drifts, the bay is thickly beset with ice, -10C, no new penguins or seals, food stocks falling. Elephant Island - We are grubby and greasy, any efforts to wash without soap ends up with us using the dirt as a sort of polish. 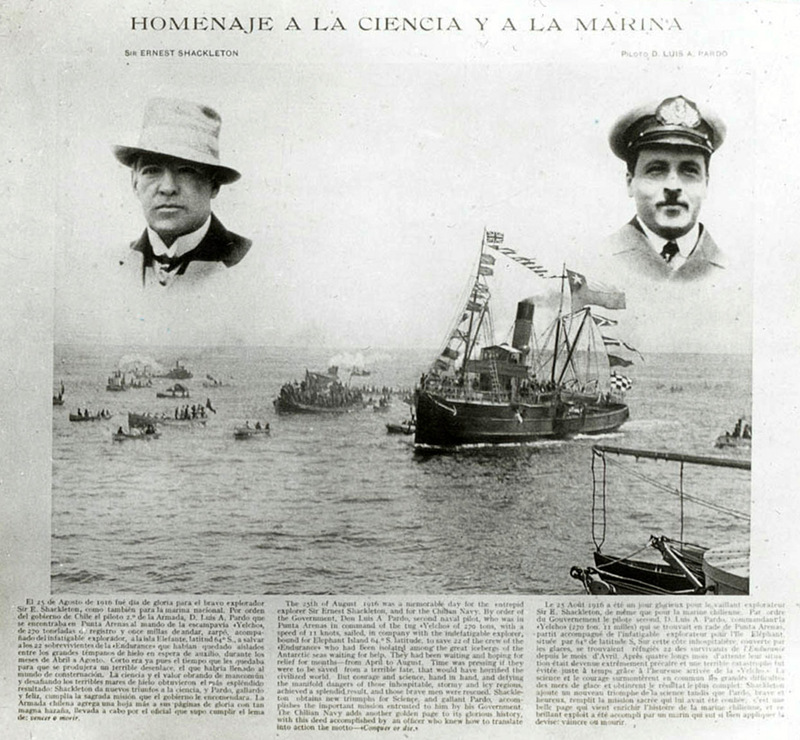 Ernest Shackleton - Chilean Naval Commander agreed to use of the Yelcho for another attempt, we will set off in a few days manned by Chilean Navy volunteers. Ernest Shackleton - With Crean and Worsley I set sail for Elephant Island once again in good weather, the Yelcho is old and too fragile to touch ice but winter is waning. Elephant Island - Wild and 4 others are to attempt to reach Deception Is (250 miles) in Oct in a remaining boat, food is now mainly limpet and seaweed hoosh. Ernest Shackleton - A Southerly gale has sent the pack north, the Yelcho can slip through in relatively fine weather. Ernest Shackleton - Approaching Elephant Island in thick fog, sea clear of any pack, dare not wait for the fog to lift, grounded bergs and reefs show we are close. Elephant Island - Boiled seal backbone for lunch. Wild as ever announced when the sea is clear of ice "Roll up your bags boys, The Boss may come today". 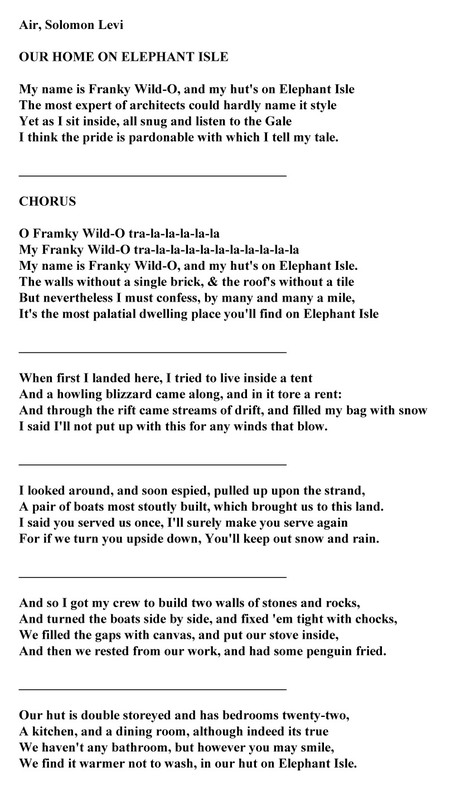 Elephant Island - At lunch, Marston - "Wild, there's a ship! shall we light a fire?" a rush while all dived for the door hole. 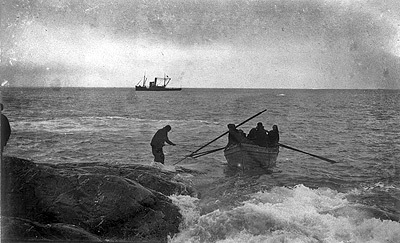 Ernest Shackleton - 1.5 miles out we see tiny figures on the beach, waving and lighting a fire, within half an hour we had reached the shore by row boat. The Boss called "Are you all well?" Wild replied "We are all well, boss", the men fell upon cigarettes thrown ashore. Shackleton would not set foot on the "godforsaken spot" again, minimal packing, heavy seas could bring the ice back once more. 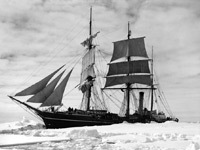 Within an hour of the Yelcho arriving, all are aboard, Shackleton will not risk the ice, two farewell toots and off north. 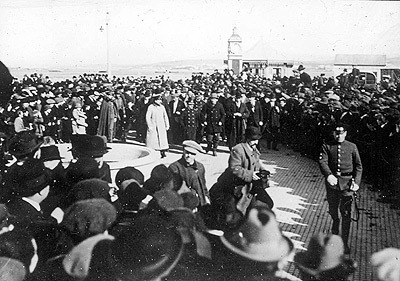 After 137 days on Elephant Island, the party arrive at Punta Arenas, Chile on 3rd of Sept 1916, not a single man had been lost. 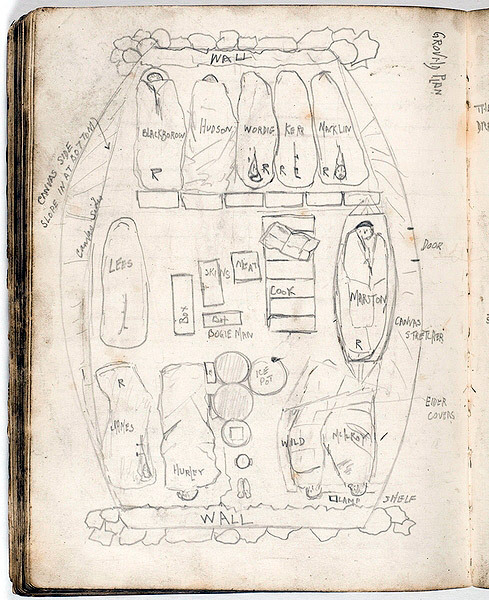 Diaries - the diaries of expedition members were used to get the information and quotes that make up this narrative of the expedition.